“Belgium in UFO Photographs – Volume 1″ is the latest book from UPIAR Publications. 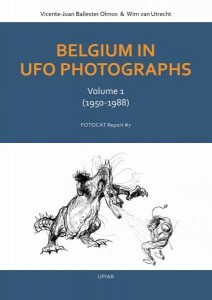 Authors are two veteran ufologists: Vicente-Juan Ballester Olmos from Spain and Wim van Utrecht from Belgium, who joined their experience not just to collect and present but – most important – to analyze carefully all UFO photographic cases (84 case histories) that took place in Belgium from 1950 to 1988, up to before the 1989 great wave of sightings in that country (which will make the main course of the forthcoming “second volume”). For over fifteen years Ballester Olmos has focused himself on UFO photo reports, with a worldwide collection and cataloguing project called Fotocat, which has so far collected 12,200 cases and published seven monographs and numerous articles. As he had previously done for Norway, Ballester Olmos was supported by local expert van Utrecht who shares the same scientific approach, as well as a participation in the EuroUfo.net collective. The result of this trans-national collaboration is not a simple catalog, but a textbook example of how we can analyze UFO reports in a rational way, using different technical skills to extract useful data in order to look for an explanation, every time this is possible. Like previous Fotocat Project publications, this amazing work is available for free in digital format on the Academia.edu platform, while collectors and libraries can obtain the paper edition (400 + XII pages in large color format, with 366 photos and illustrations, graphs and statistics, plus an accurate bibliography) ordering it from UPIAR Store online.